That you don’t see it important, even though it is. You get distracted every time you try to act on doing it. All of them conclude that you are a lazy-bee. While everyone seems to counter these reasons, doesn’t mean that you should give up on organizing your bags. These minute things help you in locating things and also, outputs you as some responsible person. 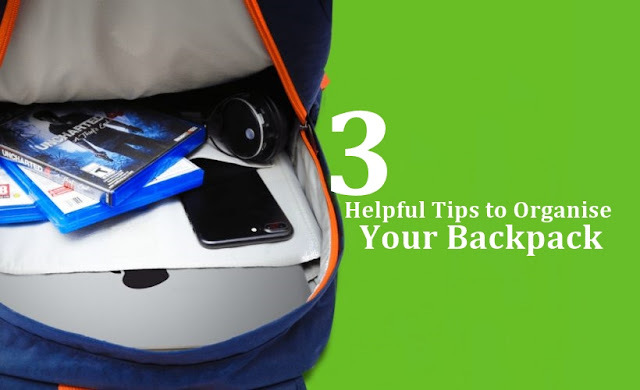 So, below are a few tips to organize your backpack stuff according to your venture or needs. But first, if your backpack is stuffed with papers, geometry, wappers, and other stuff, you need to empty it out completely. When organizing a backpack for school, all you need to do is assemble your school things into 3 departments that could be books, stationery and lunchbox, and water bottle. Next, if your classes are scheduled according to a timetable then sort out books as per the timetable for the next day and put them in compartment assigned for books. Then comes stationary, so buy a mini pouch suiting your taste and inbox a pair of pencils, rubber, scale, sharpener, and maybe a pen if needed. That's it nothing extra. Also, make a separate pocket for all your trash things like the rubble of pencil and wrappers. If your bag doesn’t have enough space then buy school bags online. Last, put in your lunchbox and water bottle in the compartment designed for them. When planning a trip, always make a list as what are necessary things that you should take on your trip. For instance, a pair of clothes is a must but not more than 3 sets as it tends to get overloaded. Next should be water bottles, camera, and light food along with a pair of socks and 1 set of boots or joggers based on your preference. Now, pile them into 3 neat sets and put them in their designated compartments. Remember if its getting overloaded and always unload an extra pair of thing. Never just throw in things in your bag as that will take most of the room in your backpack. For a bigger, spacey one buy backpack online from bembel. Lastly comes our most necessary category. Work-related stuff is most difficult to sort out. So set a diary of appointments and things needed for the next day. Next, according to that diary sort things out and put them in an organized manner in your backpack. We will suggest you buy a separate laptop bag in Pakistan or only that and put in necessary files and stationery along with your laptop in that bag.